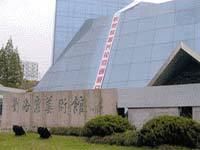 Shanghai Art museum is relocated to its new site in the beginning of year 2000. The new shanghai Art Museum is located at # 325, West Nanjing Road, Shanghai (previously the shanghai Library). The entire structure was built in the 1930's with a total area over 18,000 square meters. Internal renovation is currently underway in preparation for the coming Shanghai Biennale 2000. The exterior of the building will remain untouched in order to preserve its historical value as one of the few structures in shanghai with an early 20th century European architecture. Currently situated in the heart of shanghai, with close proximity to both The Shanghai Museum and the Shanghai Grand Opera, Shanghai Art Museum will definitely be a focal point of the city's cultural life. Shanghai Art Museum and its staff look to the new millennium with great enthusiasm. It is hoped that the museum will become a world-class establishment in terms of its exhibition facilities, resources and collections, a center for cultural expressions, art education, information exchanges and intellectual discussions in Shanghai's contemporary art scene. This has always been the dream of generations in the Shanghai art community and we are much honored to finally witness its realization. As the renovation of the new museum site and the planning of the coming biennale continues, we eagerly look forward to future cooperation with individuals, companies, foundations and organization, nationally and internationally. Liu Hai-su Art Museum is a modern national art museum with advanced facilities. It mainly collects and studies the artistic works by Mr. Liu Hai-su. The museum aims at giving aesthetic education and promoting the development of fine arts by holding exhibitions and carrying out researches. Jiang Ze-min, Chairman of the People's Republic of China inscribes the name for the museum. Now the museum has more than a thousand pieces of works donated by Master Liu Hai-su during his lifetime. They are paintings and calligraphies by famous artists of Tang, Song, Yuan, Ming,Qing Dynasties and modern time as well as art works by Mr. Liu Hai-su himself. The total construction space of the museum is approximately 5,000 square meters. There are five exhibition halls with research room, library, and studio and stack rooms in the museum. The multi-functional conference room is equipped with audio& video systems and simultaneous interpretation facilities. Liu Hai-su Art Museum is ready to provide services for both foreign and Chinese paintings and painting lovers, and also carry out broad exchange and cooperation. The newly opened Wang Kang Le Art Museum is located in City of Nin Buo, ZheJiang Province. The museum is dedicated only for the artist Wang Kang Le. It feature paintings and calligraphies by the artist. Wang Kang Le was born in Fenghua, Zhejiang Province. He began his art career in the painting department of Shanghai Commercial Press in 1924. He learned his landscape by study under famous painters such as Huang Bin Hong, Zheng Wu Chang and Zhang Da Qian. Now he is a member of Shanghai Research Institute of Culture and History, member of Shanghai Artists' Association, advisor to Huang Bin Hong Research Society, vice-chairman of Calligraphy and Painting Society of shanghai and Hong Kong Defeng Studio. Shang Mei Salon was founded by teachers at the Department of Sculpture, Shanghai University College of Fine Arts in a way of voluntary work. The aspiration of Shang Mei Salon is to make friends both at Shanghai and in abroad. The topic is not only limited to the field of art but also in many other aspects, such as music, literature, traditional Chinese opera, dancing and calligraphy as well.